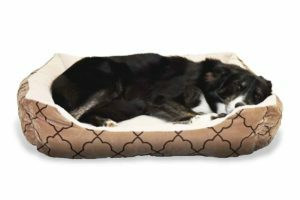 Happy, energetic, and hardworking, the Border Collie is a popular breed of dog. In fact, the American Kennel Club ranked Border Collies at number 38 in its ranking of popular dog breeds, and the breed has enjoyed a rise in popularity in recent years. These handsome black and white dogs, with bright eyes and expressive ears, are more than just a pretty face. Border Collies are often called the smartest of all the dog breeds. 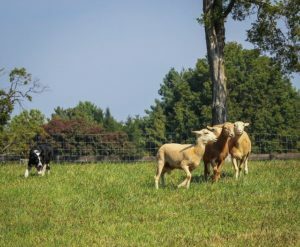 Their intelligence, agility, and stamina make them ideal working dogs and they have been a favorite choice among farmers and ranchers to help herd sheep, and other livestock animals. 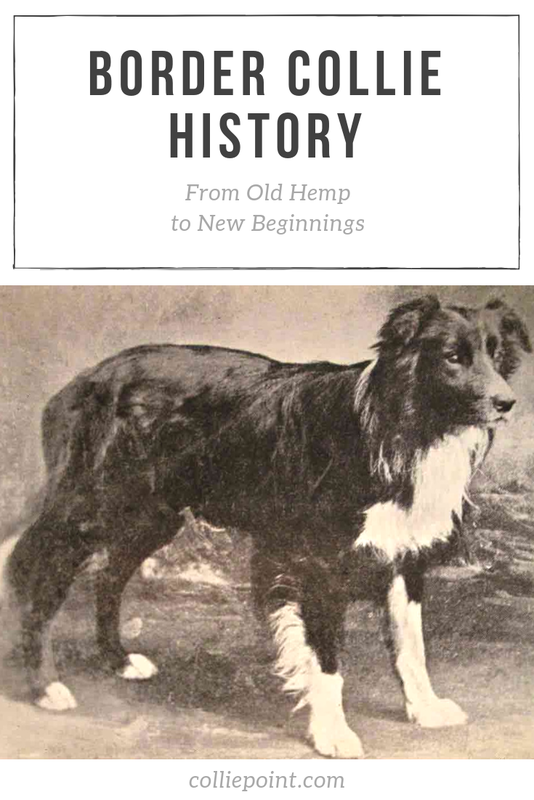 Keep reading to learn the border collie history and story of this wonderful breed, but first, a tribute to Adam Telfer and Old Hemp. Although dogs similar to today’s border collies were most likely working alongside farmers as far back as the first century B.C., all the border collies alive today can trace their roots back to one common ancestor, a dog named Old Hemp. Roman invaders to the British Isles in the first century brought with them dogs that were used to control and move their livestock. Very quickly, the dogs spread across Britain, as well as Wales, Ireland, and Scotland. Later, when the Roman Empire had fallen, and the Vikings invaded England, another type of dog was introduced, a smaller herding dog that resembled the Spitz. These dogs bred with the larger Roman dogs and the results were medium-sized dogs with longer fur that were well-adapted to the geography and climate of the British Isles, excelled a herding, and were agile and athletic… the forerunner of today’s Border Collie. It was one of these dogs that, alone, is the common ancestor of all of today’s Border Collies. This specific dog, named Old Hemp, was born in September 1893 in West Woodburn in Northumberland to a black sheepdog named Meg and a tri-colored herding dog named Roy. Old Hemp didn’t look like the Border Collies of today with his tri-colored coat and minimal amounts of white fur, but he was an extraordinary dog. Herding dogs in the days prior to dog shows and breed standards were bred more for their abilities than for their appearances as evidenced by Old Hemp. While still a pup, less than six weeks old, Old Hemp demonstrated his tremendous herding ability. The dog’s owner and breeder, Adam Telfer, was impressed with Old Hemp’s intelligence, natural instincts, and herding ability and the animal quickly became the top working dog on the farm. One aspect of Old Hemp’s herding style that made him unique among other sheepdogs is that he did not rely on barking to do his job. Instead, he used his body positions. He also seems to know how and where the sheep would be moving and was able to quickly and easily head them off. Old Hemp’s owner, Adam Telfer, was quite experienced with sheepdogs but had never before seen a dog of Old Hemp’s caliber. Old Hemp’s reputation as an outstanding herder made him highly sought after as a stud dog. People around the region wanted puppies sired by the legendary herding dog so they brought their dames to Telfer. By some accounts, Old Hemp may have had as many as 200 pups. Most of these animals continued the traits that made Old Hemp such a preeminent herding dog, as well as his physical characteristics, including his rough coat and medium build. Because his lineage is responsible for the propagation of the Border Collie traits, Old Hemp has been called the ‘foundation sire’ of the breed…the animal that originated the dog breed. Old Hemp is listed in the stud book of the International Sheepdog Society, which was founded in Scotland in 1906. In fact, he is the ninth entry out of more than 300,000 dogs. His contribution to the Border Collie breed cannot be understated, and Telfer, the dog’s owner, and breeder, is credited with producing a strong line of herding dogs that set the stage for the creation of the Border Collie breed. There are no existing records to show if Telfer entered Old Hemp in any of the sheepdog trial events. It is known, however, that Old Hemp’s grandson, a dog named Sweep, that was also owned and bred by Telfer, excelled at these types of competitions. He twice won the International Sheep Dog Society’s sheepdog trials championship. 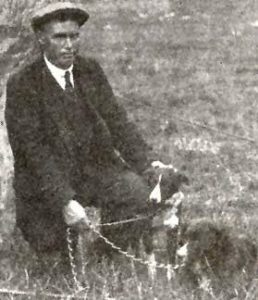 Another of Old Hemp’s descendants, a Telfer-owned dog appropriately named Young Hemp, was the 1924 International Farmers’ Championship Sheepdog winner. In fact, Old Hemp produced a steady line of champions. Between 1906 and 1951, every one of the twenty-nine dogs that captured this championship was from Old Hemp’s direct lineage. Other breeders of herding dogs took notice of the qualities that made Old Hemp such a superior animal. They sought to emulate these traits in their own dogs, further strengthening the overall breed. With breeders producing dogs with similar looks and abilities, it was time to name the breed and declare it – or at least try to – its own specific breed of dog. The first reference to this breed of dog is called a Border Collie can be traced back to 1915 when it was coined by the secretary of the International Sheep Dog Society, James Reid. He was seeking a way to distinguish the dogs he was registering in the International Sheep Dog Society from the other types of Collies, including the Scotch Collie, the Smooth Collie, and the Rough Collie. These kinds of collies all emerged from the same stock of dogs on the British Isles. But as dog shows became popular and breed standards were set in place in the 1850s and 1860s, the collie breeds got more compartmentalized as breeder bred dogs to meet the specific standards of the different collie breeds. The first word in the dog breed’s name, ‘Border’, most likely is a place name referring to the border area between England and Scotland. The term ‘collie’ or ‘colley’, however, has a bit more complex etymology. ‘Collie’ is thought to originate in the Celtic language as a term meaning ‘useful’. Others point out that colley sheep in the Scottish Highlands is a type of sheep that are noted for their black markings, adding that ‘colley’ is an old Anglo-Saxon word for the color black. It is, therefore, quite conceivable that the Border Collie took its name from the black markings on its coat. 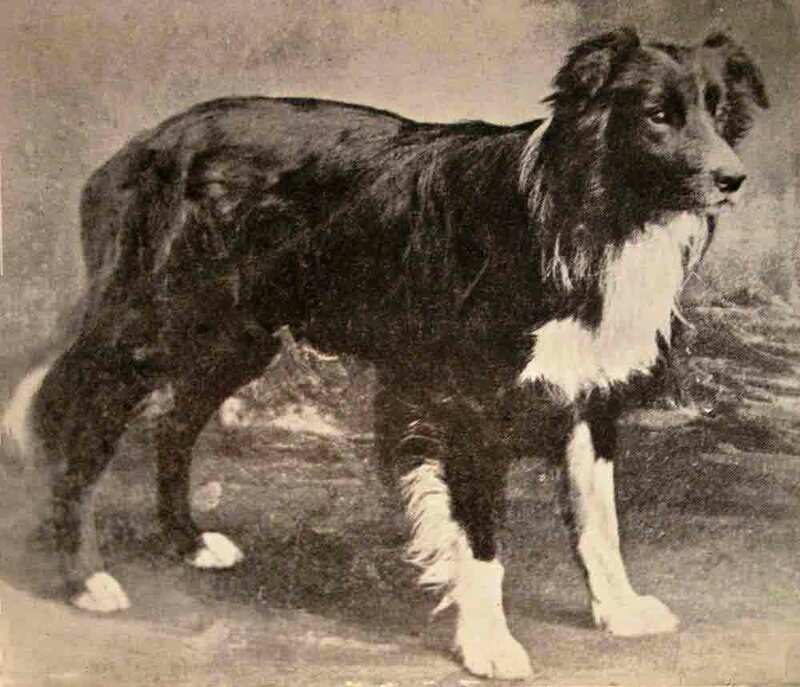 As early as the 1880s and 1890s, exceptional Border Collies were being exported to other countries where sheep ranching was a leading agricultural practice. Expert herding dogs from the British Isles were sent to Australia, New Zealand, the United States, Canada, and Argentina. As word of the Border Collies’ prowess spread internationally, breeding practices and breeding stock from England and Scotland were adopted by dog breeders around the globe. Although they were not yet known as Border Collies, the sheep herding dogs were first brought to New Zealand’s rolling pasture lands as early as 1858. James Lilico, a resident of Christchurch, New Zealand, was responsible for bringing several dogs from Scotland’s top sheepdog breeders to New Zealand. 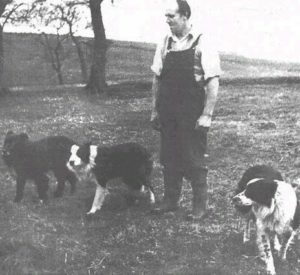 Among these dogs was Hindhope Jed, a descendant of Old Hemp’s that was born in 1895 in the area of Hindhope, Scotland, and bred by John Elliot. Elliot’s superb dogs were sought after by serious aficionados of the breed. In fact, Elliot even gifted one of his Border Collie pups to Queen Victoria. Before relocating to New Zealand, Hindhope Jed won three of Scotland’s top sheepdog trials. In his new home in New Zealand, Hindhope Jed proved himself to be an impressive representation of his breed. Hindhope Jed became the Sheep Dog Champion of both New Zealand and neighboring Australia. Hindhope Jed wasn’t the only Border Collie that Lilico imported to New Zealand. He brought in other superb herding dogs as well, including Old Bob, Ness, Maudie, and Moss of Ancrum. These dogs dominated the sheepdog trial circuit and helped to energize the breeding stock for Border Collies in both New Zealand and Australia. In Canada and the United States in the years following the end of the Civil War, prominent sheep farmers started to import sheep from Scotland and other areas. Coming over on the cargo ships with the sheep were the sheepdogs, including dogs that would later be called Border Collies. The dogs’ handlers demonstrated the animals’ abilities to the amazed American ranchers and many of them sent word back to Scotland and England asking for more herding dogs to be sent across the Atlantic to the Americas. Settlers pushed westward into the Great Plains of the United States and Canada, and the vast prairies proved to be ideal for raising livestock. Prior to the widespread use of barbed wire fencing, which was invented in 1874, the prairie was a wide-open region. It was necessary to move large herds of sheep and cattle across great distances, either to take them to fresh pasture areas, to move them to winter grazing grounds, or to take them to market. The task of containing and moving the livestock was to the responsibility of ranch hands on horseback, with the invaluable assistance of herding dogs, particularly Border Collies. According to written accounts of the day, a herd of a thousand sheep could be managed by one rancher and one good sheep herding dog. Just like the breed’s ‘foundation sire’, Old Hemp, a top quality Border Collie of the 1880s to 1900s only barked to warn of danger. The working dog never left the sheep unattended and was not distracted by a flushed rabbit or pheasant. If a predator threatened the flock, the Border Collie was ready to protect his charges. One of the first sheep herding trials in the United States took place in 1880 in Philadelphia. Many area newspapers reported on the event, which was called the “Great International Collie Trial”. At this time, the name Border Collie had not yet been assigned, so the umbrella term, “collie”, was used. Dogs competing in the event, therefore, included all types of collie dogs. The dog that caught everyone’s attention was a Scottish import. Oscar, a tan and black collie, was a sheep herding trial champion in Scotland four years earlier when his breeder, a gentleman named Steele, entered him. While the Border Collie was earning a reputation for its tremendous herding ability, the dog was also working its way into the hearts of dog lovers. Energetic and tireless when working, the breed was calm, docile, and loving. For the twentieth century, the Border Collie had a name, but not an official recognition, at least not in the United States. The dog that helped to change all that was Wiston Cap. Born in 1963, Wiston Cap has been singled out as the dog that had the most influence on the Border Collies we see today. The dog was the product of W.S. Hetherington’s breeding efforts and was shown and handled by John Richardson. An exquisite animal, Wiston Cap is the dog that set the standards for the breed, as designated by the International Sheep Dog Society. All Border Collies since then have been measured and evaluated against the standards set by Wiston Cap. A champion and a stud, Wiston Cap’s descendants include three Supreme Champions. The International Sheep Dog Society is today located in Bedford, England and the organization keeps careful breeding records for the Border Collies bred around the world. It was through their efforts, and the efforts of Border Collie enthusiasts everywhere, that the American Kennel Club officially recognized the Border Collie in 1995. More and more people who are unrelated to the farming and ranching industry are discovering the Border Collie breed. The traits that make this breed an exceptional herding dog also make it a great family dog when given the proper training and attention. The Border Collie is intelligent, attentive, hard-working, active, agile, affectionate, and athletic. To this day, more and more border collies are finding their ways off of farms and into the homes of loving families. While many are still working border collies to this day, the ones that aren’t, still hold their heritage deep in their hearts. Now you know the border collie history. As a border collie I must say this article is misleading. This is not a good family dog, this is a dog good for families who do not have small children, who are very active and love the , and who have the time patiance (and money) to invest in training them. While some bc are low key, most need a lot, A LOT of physical and some mental activity in absence of a job like they would have in a farm. My first bc had to be walked 3 times a day for at least 20 min, followed by other 15-30 min of fetching outdoors. I could not leave her alone (with my other more calm bc) for more than 5 hours or she would get herself busy (this is not average, but not unusual either). Like most working dogs, if you do not keep their bodies and brains active, they will find a hobby which is very likely you won’t appreciate. If you have small kids, they will try to herd them (probably nipping at their legs), another thing you and your kids won’t enjoy. Lastly, that they are smart means they can be trained but you need to really commit. Another aspect important to mention, they shed quite a bit, especially the ones with long hair (thos clasification is also misleading, the “long hair” is puffy, the “short” hair is sleek regardless of actual length. Never shave a bc, but do brush it!). Whatever breed you get, do research with experts on the breed to make sure is right for your life style, and consider adopting! Thanks for the huge response Beliza, I appreciate the time you put into it! Yes, border collies require lots of attention and stimulation, but they can be conditioned to need less over time. They are definitely not a dog for a family who works 10 hours a day and then sits on the couch watching TV the rest of the night. As far as the nipping goes, that is certainly a concern, but can be trained out of them. And yes you are right about the shedding. As you said, border collies are not for every family, so it is important to do the research ahead of time! I beg to differ on the comment about Border Collies and small children. I have raised Border Collies for twenty years and used an older farm dog Jack, for my breeding foundation. He put his temperament into all his puppies and they have been wonderful with children. Infact my first two females that I used as mates for him would guard my oldest granddaughter as she slept. This line was and still is eager to play with children and very patient with them. My Tippy has watched my youngest grandson grow up. Even before her was toddling, she allowed him to poke and prod at her with no negative reactions. She still adores him at age seven and she is now 10 years old. That’s great to hear Anita! I’m sure with each bc it’s different, but it sounds like you have had quite a great experience with border collies, as have I! High five on your comment! You’ve failed to explain about the short haired border collie, I have one and didn’t know they even existed. It’s a great dog he’s very smart and wears me out everyday. Yes, you’re right Mike. The short-haired border collies are called “smooth coated” and they are definitely not as common as the long-haired (“rough coated”) ones. I wrote a quick summary of the two in this article, but I am planning on writing more about them in the future. I got to see the marker for Hemp. Hi I have a border collie his name is Oreo he is on Facebook. We live in the South Loop Chicago. He is the best thing that’s ever happened to me and my sister Laura. That’s great to hear! Does he have an Instagram account too? If you send me a link to his facebook or instagram page to [email protected], I will share the photos! I have a beautiful blue merle shorthair border collie…his name is Baldur..smart as can be but he has herded and nipped my grandkids …They are Not a dog for small children if they are very instinctual and will herd them like sheep and also they don’t like screaming running or craziness in the house…Baldur will chase a ball and fetch til he collapses from exhaustion..lol..he’s extremely intelligent and I have started training him to be my fiance’s fetch dog and companion as he is a disabled veteran. These dogs are great family dogs for orderly homes without children under the age of 5 in my opinion. I’m no border collie expert..this is my first ever but mine is something very special and he has a forever home…I may breed him and see where it goes as we live in the sheep capital of the US..San Angelo, Texas. But first he will continue his training. Baldur sounds like a wonderful border collie! Just keep on the training and I’m sure he will eventually be a good boy with your grandkids. Yep, you’re right Parker. It really comes down to the dog and how you raise them. Puppies also tend to be a little more of a handful than adults! ball that I thought would become a course coat like my first, Shasta(RIP). Annie turned one year old 10/18/18, and she would fetch the Frisbee dawn till dusk if I had it in me. BC’s are best dogs ever in my humble opinion. Other dog owners ask “How did you train her to be so well behaved?” I say, “I didn’t; its her “job” to keep me in line.” Oh and BTW, I have 7 grandchildren who grew up with Shasta, and now Annie. All it took was one ore two instructions, and the kids are no longer sheep if you get my drift. Great article! Thanks. Thanks for the comment, Rick! I totally agree with you! All it takes is a little training and some love. I think you’ll find that you can spend the same amount of time exercising him if you spend some time teaching him tricks and training him. BC’s seem to get as tired from mental stimulation (Training) as they do from exercising and it is just as rewarding to them. Plus you can do a lot of training inside so you don’t have to be outside constantly. I have a smooth coat BC named Daisy. She was a rescue and caused me to fall in love with this breed. We walk off leash for at least an hour on hiking trails every day. This curbs her energy level. She is sweet, cuddly, goofy and smart. I have never seen her herd, but I did see her direct an aggressive dog away from me by chasing it in ever larger circle away from me. It was amazing to see her work like that. Daisy sounds like a wonderful dog Chris. I’ve seen my collie do some pretty funny things when he sees objects he doesn’t recognize at night. Thanks for sharing! I have a border collie that came from working parents. She is super nice with kids and loves to cuddle. I trained her as a pup to not nip and while energetic she’s doesn’t need much more that some attention when I get off work. Any time I see a video or article about this breed you have the person that makes it seem like the breed is impossible and that is not true. Thanks for the comment Bobo! It seems like for the most part the people who complain about the breed either a) don’t put in the time to train them and give them the attention they need, or b) actually have a bc that has issues they can’t train out. It seems like it’s almost always option “a” but I think there are some problem collies that do exist. I have had dogs my whole life, and I believe my border collie (Myles) is the best all round dog. #1 rule is they must be trained! He has more energy than you could ever expect and when we would come home he just lays down. Now he is 13 and I have to govern him, but he would still go all day if I let him. Don’t think I will get anything but borders here on out. Also there are 2 kinds of bc’s, those that bite and those that don’t. If you want on for a working dog make sure he’s a biter! Myles is a biter on my cows, but never bit the little ones. Thanks for sharing Martin. You’re certainly right about the #1 rule and about how great border collies are. At this point, I don’t have a farm but I can imagine the trait is important. Yes, good article. I and my colleagues are the people responsible for installing the monument to Telfer and Hemp at West Woodburn. Just as a point of fact, although Hemp was never used in Trials, Adam Telfer was a very well respected Trialist…and won many accolades. He was also a patron of the International Sheepdog Society. Wow Simon, thanks for commenting! That’s great that you were involved in the installation of the monument. I’d love to see it someday. And thanks for the additional info, I’m glad to hear it from someone who intimately knows the history. I’d love to hear more about it sometime. Every dog has their own personality & truly depends on the owner & ability to love, train, time spent with dog. Even depends on the place you live & provide for your dog! I do agree that the Border Collie is truly one of the smartest bred ever! I am a breeder & I truly love ever dog born! They LOVE unconditionally!!! You are certainly right, Attie. Dogs are wonderful. Do you breed BC’s or another breed? I’m curious to hear more! Many thanks for your brief, extremely informative article. I have owned four border collies. The first and second when I was farming and used as cattle dogs, the third and fourth as pets. To own a bc is a privilege and it is imperative to understand their needs. It is common knowledge that they require a tremendous amount of exercise but what is just as important and not often understood is that they also need an equal amount of mental stimulation. A bc that causes problems with nipping, barking, chewing shoes and furniture is not a bad dog, simply frustrated. Imagine a highly intelligent child at home with no books, toys, jigsaws or games. If you have a lawn or open area, make a simple agility course. If not take a few foldable hurdles and a collapsible tunnel to your local park and have fun with your dog. If you have a puppy, encourage it to socialise with other dogs. Puppy clubs might not be your idea of fun but the dogs love it. Remember, you took on the commitment. No matter how much you do for dog, it will do more for you without reservation. Lastly, for those who think that a bc is not good with children, think again. A well adjusted bc is the most fantastic companion for a young child. It will only “herd” if bored and lacking purpose but will steer a child away from perceived danger. That was what it was bred for. I now live in SW France and lost my last bc to cancer. In two weeks time I will be driving to West Wales to collect two new pups. The are Kennel Club and ISDS registered and come from a working farm. The owner has kindly kept them until 16 weeks and gone through all the rabies inoculations and paperwork for the issue of passports so that they may travel across Europe. I am so looking forward to this new adventure. My advice to anyone considering a bc;- Ensure you have the time. Be aware that it will be your constant companion. Make sure you understand it’s nutritional requirements and try to love it as much as it will love you. I saw this on Facebook. I posted a comment I will give to you: That may be Old Hemp in the photo, but that looks just like my Old Tip, actually Tippy – Tippicanoe, the Border Collie that was my first dog that I grew up with. I can tell you, there were times as we walked along the cold Lake Michigan shoreline, only ones on the snow covered beach, sometimes Tip didn’t quite look tame. 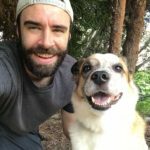 She was an amazing dog. I’ll have to look into that and get back to you, Guillermo. Beautiful art by the way!